Tales of a Pee Dee Mama: Baby, It's Cold Outside! Thankfully, NOT where I live. 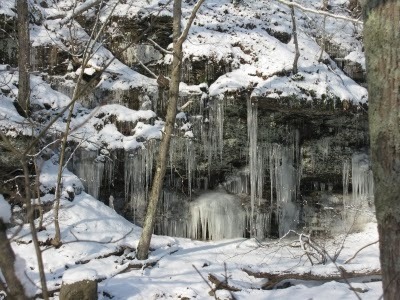 These are Icicle Cliffs of Buffs County, PA. Photo from FreeDigital Photos. Yesterday when I got up at 5am to workout and take the dog out, it was a nice 63 degrees. It was pleasant. This morning I woke up to a temperature of 16 degrees with a wind chill of 8. Now, for those of you who are up north and experiencing temperatures in the -30's, I know this would seem like a heat wave to you. But for those of us down here in the South, this is NOT normal! According to southcarolina.stateguidesusa.com, the average temperatures for January for South Carolina are 56 for the high and 33 for the low. That's what we're used to here. This is crazy cold for us. Many of the local schools are delayed a couple of hours this morning due to the extreme cold. I've seen many people on my Facebook feed ridiculing this idea. After having taught in the public school system in South Carolina, let me attempt to explain why I think this delay is a good idea. First, like I said earlier, here in South Carolina, we aren't used to temperatures this low. We aren't equipped for it. School buses are kept outside, not in garages to keep them out of the freezing temps. Routine preparations for extreme cold aren't done here. I know I read of several school districts making preparations yesterday, which I'm sure will be helpful. Second, many children in South Carolina don't dress appropriately enough for the weather during our usual cold temperatures. The child poverty rate in South Carolina is 27%. Many, if not all, of these children either walk to school or ride the bus. Either way, they will have to be out in these cold temperatures for a decent amount of time. For those children without adequate warm clothing, this is dangerous. My prayer is that the majority of them will have some sort of safe heating system at home or at least multiple blankets to protect them from the icy temperatures. I hope that all of you are able to stay warm today! We have to go out to an orthodontist appointment for the Boy this morning and then ballet for Little Red and basketball for Little Red and Sassy this afternoon. Other than those outings, we'll be inside. I am definitely thankful for my warm house today. How do you prepare for the extreme cold temperatures?